Born at Runcorn, Cheshire, 14 May 1853, to a Manx father and a Cumberland mother and brought up in Liverpool; however spent considerable time in his youth with uncle's family in Ballaugh and Manx grandmother. Also spent some time helping a schoolmaster uncle at Kirk Maughold. Consumate self publicist and not always entirely truthful - not for nothing did Vivien Allen choose the punning subtitle "Portrait of a Victorian Romancer" for her biography. Hall Caine's own biography "My Story" contains few hard facts and where his early connection with the Island is concerned is somewhat misleading. For a thirty year period from c.1890 his novels, generally running to well over 300 pages sold in their 100,000s - his plays were also successful in the Edwardian theatre and he was by far and away the most highly paid novelist of his day. His friendship of Rossetti in his final drug-problemed years also gives Caine a claim to fame. For details of his friendship with 'Jack the Ripper' see Vivien Allen's excellent biography. Hall Caine's early 'married' life was unconventional, whilst staying in London in 1882 with a bachelor friend, the two had their evening meals brought in from a nearby coffee shop. The two young girls who worked there formed an attachment to the young journalists - this was exploited by the girls' fathers to pressurise the pair into making 'honest women' of the pair. Although it is likely that only mild flirting had taken place, his friend Robinson agreed to marry his girl but Caine was left with the 13 year old Mary Chandler, who however adored him. Whilst he could legally marry her, Caine felt she was too young (and very likely he was not in the mood to marry) but did offer to pay for her education (yet another theme that landed up in his novels). However in December 1882 Mary's stepfather threw her out and Hall Caine took her into his small lodgings. Like Hall Caine, who was small at 5'3", Mary too was small, pretty and with a charming voice; many of his friends assumed that he too had bowed to pressure and married her. Soon afterwards he sent her to Sevenoaks to acquire some schooling and spent his free weekends with her. To keep her company he allowed his young sister Lily, then aged 13, to stay with her - she was sworn to secrecy so that news of this strange arrangement did not leak back to his Baptist chapel-going parents in Liverpool. Lily and Mary became lifelong friends and Lily, who adored her elder brother, kept her promise and no news leaked out until Hall Caine told them himself. As might be expected Mary became pregnant in 1884 at the age of 14 - by April, Mary and a housekeeper were installed at a house in Hampstead (Hall Caine found new lodgings near the Law Courts) and Ralph Hall Caine was born 15 August 1884. Delaying registering the birth for a month Hall Caine perjured himself by describing the mother as "Mary Alice Caine, formerly Chandler" - they were not actually to marry until 3 September 1886, by declaration in Edinburgh, so that Hall Caine could avoid any bad publicity. Even then he romanced somewhat, giving her age as 23 whereas she was only 17 to his 33. Hall Caine moved to the Island in 1894. Initially the Caines rented Greeba Castle (not a castle but one of a pair of castellated houses built 1849 and designed by John Robinson of Douglas) standing above the Douglas-Peel road. They later took a house in Peel before buying Greeba Castle (by then in a poor state of repair) in 1896 which remained his home until his death in 1931. His house became, like those of today's Hollywood stars, a place for tourists to gawp at - many postcards both of the house and/or Hall Caine were issued. An interesting comment on the back of that illustrated says "on way back passed the owner, funny looking chap"! His architectural training was used in his remodelling of the house - the old door in the south face approached by steep steps was replaced by a new one on the west face approached by a terrace. This explains the drive shown above which apparently terminates at some windows. 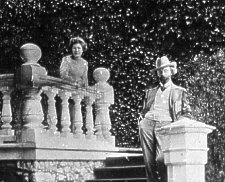 He and his wife were often photographed on this balustraded terrace, or as he called it 'the piazza'. Hall Caine was knighted in 1918. Some connection to Hall Caine is claimed by many of Manx descent (though I have seldom heard the same claim made on the Island!). Grandfather William died 1844, Isabella on 28 Jan 1866 after which Hall Caine spent his summer holidays with his Aunt Catherine Teare. His aunt Catherine had married James Teare at Braddan on 23 October 1858. James was schoolmaster at Maughold 1861-1870; they had 6 children before James died from tuberculosis in December 1871. It was the death of his beloved maternal grandfather, Ralph Hall, in January 1870, that affected him deeply - towards the end of 1870 he gave up his job as draughtsman in an Architect's office in Liverpool and went to stay with his aunt. As James Teare was already seriously ill, Hall Caine's arrival was welcomed as he could assist in the school. He stayed on the Island for over a year - restoring a deserted tholtan near the school as his Aunt's house would be somewhat crowded. It is the insights and material which he acquired at this time that he would recycle in his later Manx stories - much to the annoyance of those who recognised themselves. He did however fall in love with Maughold Head, even to the extent of buying, in 1909, a plot on the head for his grave, but when in 1931 shortly before his death he found he could not manage the climb (and disliking the thought that others would not then make the pilgrimage to it that he hoped for) he bought a plot in Maughold yard where one can see the huge memorial stone. From Coronation issue and part of a supposed Gala Performance for their Majesties; item eleven in the programme is "Mr. Rudyard Kipling, in his universal athletic costume, will recite a New and Original Epochmaker, entitled, The Chantey of the Nations." see also ILN 10 Oct 1891. (only the major publications (or those with Manx interest) are given - fuller bibliographies in Cubbon or by Vivien Allen. The Restoration of Ancient Buildings. Papers by William Morris, Samuel Huggins, J. J. Stevenson, etc., edited by T. H. Hall Caine. Royal Institution, Liverpool. 1877. Crown 8vo. 50 pp. An old Manx Bard. Liverpool Weekly Mercury. 1882. Recollections of D. G. Rossetti. [First edn.] 1882. Cobwebs of Criticism: a Review of the First Reviewers of the 'Lake,' ' Satanic,' and 'Cockney' Schools; by T. Hall Caine. [First edn. ] London: Elliot Stock. 1883. p. xxiv,266. The Shadow of a Crime. [First edn.] London: Chatto & Windus. 1885. A Son of Hagar. [First edn.] London: Chatto & Windus. 1886. pp. 303. Life of Samuel Taylor Coleridge. [First edn.] London Walter Scott. 1887. pp. 154,xxi. Ben-my-Chree : a drama (with Wilson Barrett). [First edn. ] 1888. The Bondman : a New Saga. In 3 vols. [First edn.] London : Heinemann. 1890. pp. xi,254 (first appeared in installments in Isle of Man Times). The Scapegoat: a Romance. [First edn. ] London: Heinemann. 1891. pp. x,318. Mary Magdalene, the new Apocrypha. 1891. The Fate of Fenella. 3 vols. illustrated. 1892. The Jew in Literature. The Author. June, 1892. Cap'n Davy's Honeymoon; The Last Confession; The Blind Mother. [First edn.] London: Heinemann. 1893. Little Man Island ; Scenes and specimen days in the Isle of Man. I.M.S.P. Co. Douglas. 1894. pp. 50. Illus. The Manxman. [First edn. ] London: Heinemann. 1894. pp. vi,439. Jan the Icelander. In Home Sweet Home. (100 copies only.) 1896. The Christian. A story. London: Heinemann. 1897. pp. iv,453 Illus (The Christian. First appeared in Windsor Mag. as a serial commencing in Dec. 1896). T. E. Brown : in Memoriam. In LRI.T. 1897. The Christian: a drama. London: Horace Cox. 1898. pp. 106. The Prodigal Son. [First edn.] London : Heinemann. 1904. pp. viii,426. The Prodigal Son: a novelised version of Mr. Hall Caine's Play; by S. R. Squires. Derby: Bacon & Hudson. c. 1905. Drink : a love story on a great question. Illus. by Cyrus Cuneo. London: George Newnes. 1906. pp. v,118. The Bondman Play. The Daily Mail. 1906. pp. xvi,240. Illus. Pete : a Drama in four acts. By Hall Caine and Louis N. Parker. Dramatised from 'Mr. Hall Caine's novel 'The Manxman.' London: Collier & Co. 1908. pp. iv,164. My Story. London: Heinemann. 1908. pp. xiii,406. +Portrait (first appeared In English Writers of To-day series. No. 4. In M.A.P. April 18th to Sept. 19th, 1908. The Master of Man; the story of a sin. [First edn.] London : Heinemanm. 1921. pp. viii,432. The Woman Thou Gavest Me. 1921. Graih my Chree. In Lyra Celtica, 2nd edn. 1924, p. 309, with biog. note p. 442.